Wizards Storage Portal was upgraded on October 7. The upgrade to version 3.22 was the first step towards deeper insights regarding VMware guests and preparations for the coming versions of TSM and the Storwize family products. 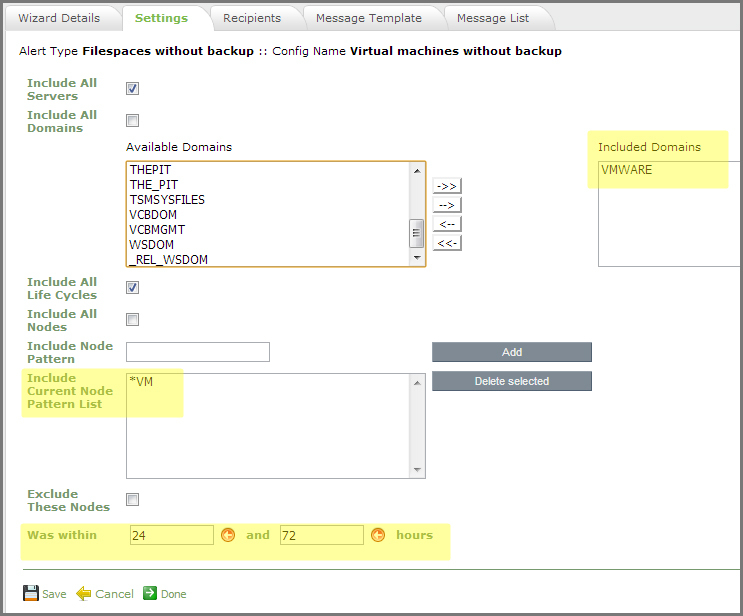 TSM4VE is now more visible The new version of TSM for Virtual Environments has become a powerful and well accepted solution for backing up VMware guests. With this upgrade, we have included a couple of new reports, that makes TSM4VE content more visible. The Configuration Overview now has a direct link to all your VE Guests. This gives a complete overview of all you TSM4VE guest servers, their datamovers, datacenter and when the latest backup was performed. We will of course add a detail view of your VE Guest in one of the coming upgrade. More about that later!! We have chosen to look for filespaces in the domain named “VMWARE”, where the Nodename ends with “VM” and where the latest backup was between 24 and 72 hours ago. Alerts about missing backup, can of course be sent as email or SMS/text messages. 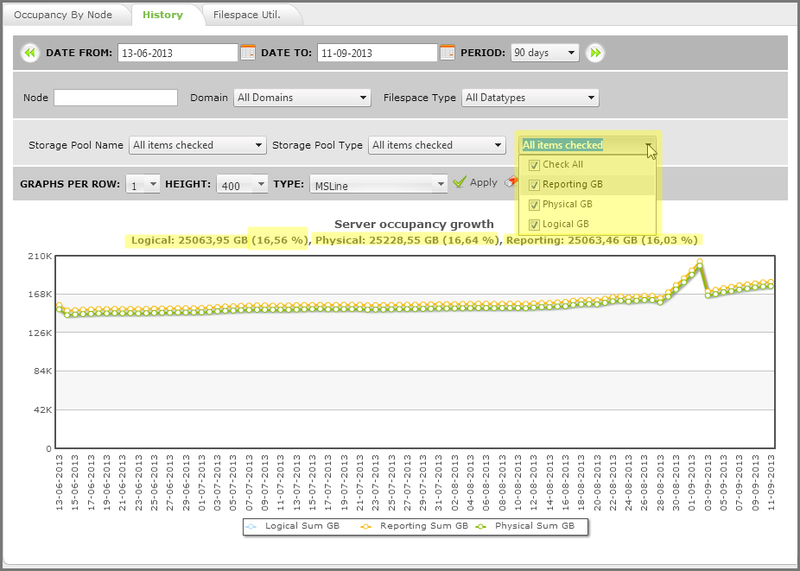 It was time to give the Occupancy History graph a serious overhaul. As you can see from the example below, the history occupancy graph is now heavily configurable. You may filter on nodenames, Filespace datatype, domain, storagepool names and even storagepool types. BUT the feature we all have been waiting for, was the ability to see Logical, Physical and REPORTING values side by side. You may also notice, that the Occupancy Graph found under Node Details now performance a LOT faster than before. IBM has started a beta-program for TSM 7.1 and we are of course part of that. Apart from building support for this new TSM Server version, we will continue to expand the TSM4VE reporting capabilities. A new version of the TSM Agent is also close by. Remember to configure Auto-update in the Wizards Control Center(described in the vers. 3.21 changelog). Many of the changes this time is under the hood. The beta-program for SVC 7.2 is in progress. And we are building support for the new hardware configurations that may appear in the future. One of our US customers discovered a time-zone issue in our performance Widgets. The result was a graph that was only partly shown. This has now been fixed. But we still struggle with ideas about how to format combined graphs where the SVC clusters are in different timezones. Input is very welcome. The Error log report has been extended with new filters. It’s now possible to search for both Node Names and Conditions. Support for firmware 7.2 is priority right now. We will also introduce a new way of managing estimated performance values. It will be a kind of “Bulk-update” feature. Furthermore, capacity reporting and monitoring will be extended, giving better warnings about pinned capacity in relation to thin-provisioning. We have received a couple of tickets regarding issues with our loader in relation to IE. Particularly TSM related pages had problems with certain versions of IE. We do what we can to test our code on various browser versions, and if you use the recent versions of IE, Firefox or Chrome you should not see any stability issues. Over the coming months, we will gradually phase out the use of adobe Flash and replace our graphs with html5 versions instead.